Evil never sounded so clear. Listen up! 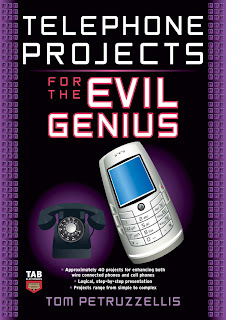 Telephone Projects for the Evil Genius has everything you need to build and customize both wired and wireless phone gadgets that not only save you money, but also improve the quality of your life! Using easy-to-find parts and tools for creating both retro and modern phone projects, this do-it-yourself guide begins with some background on the development of the landline phone and the cell. You'll review basic building techniques, such as installing components, building circuits, and soldering. Then you'll dive into the projects, which, while they range from easy to complex, are all designed to optimize your time and simplify your life! El mal nunca había sonado tan claro. Escuchen! Proyectos de teléfono para el Genio Malvado tiene todo lo necesario para crear y personalizar ambos aparatos telefónicos alámbricos e inalámbricos, que no sólo le ahorrará dinero, sino también mejorar la calidad de tu vida! Utilización fácil de encontrar las piezas y herramientas para la creación de los dos proyectos de teléfono retro y moderno, este hágalouno mismo guía comienza con algunos antecedentes sobre el desarrollo de la línea de teléfono fijo y la célular. Vas a revisar las técnicas básicas de construcción, tales como la instalación de componentes, circuitos de construcción y soldadura. A continuación, a bucear en los proyectos, que, al mismo tiempo van desde fácil a lo complejo, están diseñadas para optimizar su tiempo y simplificar su vida! Electronic Parts Installation and Soldering. Telephone Amplifiers and Projects. Magnetic Phone Pickup. Direct Connect. Hold Circuits and Projects. Telephone Hold and Line-in-Use. Basic Music-on-Hold. Universal Hold Circuit. Automatic Music-on-Hold. Telephone Ringer Projects. Silent Cellular Phone Ringer. Remote Telephone Ringer. Telephone Ring Detector. Wireless Telephone Ringer. Telephone Ring Generator. Phone Line Status Circuits and Projects. Phone In-Use Indicator. Cut Phone Line Detector. Phone Line-in-Use Relay. Controller. Single Phone Line Status Light. Two-Line Phone Status Indicator. Smart Phone Light. Telephone Line Vigilant. Telephone and Phone Line Testers. Simple Telephone Line Tester. Off-Line Telephone Tester. Telephone Line Tester. Telephone Line Simulator. Page-Alert. Alarm Switch/Sensor Module. Temperature/Voltage Level Module. Tele-Alert Project. Motion Module. Listen-in Module.